KIEV, December 3. /TASS/. The Ukrainian Security Service (SBU) is questioning about 20 priests from the Rovno and Sarny Eparchies of the Ukrainian Orthodox Church, head of the Opposition Bloc faction in the Verkhovna Rada (parliament) Vadim Novinsky said at a meeting of the Rada’s conciliation board. "At this very moment, SBU investigators are questioning about 20 priests from the Rovno and Sarny Eparchies of the Ukrainian Orthodox Church," he said. According to Novinsky, such actions are aimed at exerting pressure on the Ukrainian Orthodox Church "for one purpose - to compel the prelates of the Ukrainian Orthodox Church to participate in the unification council of the so-called church, which the people are already calling ‘the church of the Poroshnko Patriarchate’." On Friday, agents from the Ukrainian spy agency conducted searches at the residence of Metropolitan Pavel, the head of the Kiev Pechersk Lavra (or the Kiev Monastery of the Caves), as well as in the monastery’s country farm located in the Voronkov settlement, in the Kiev Region. The SBU was investigating Metropolitan Pavel under a criminal code covering "violations of civil equality depending on ethnic or religious background, and incitement to religious hostility." 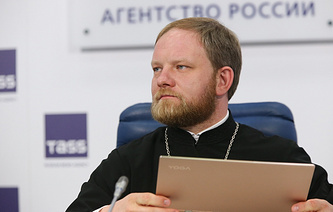 A booklet and Metropolitan Pavel’s international passport were seized during the searches. The Lavra’s head slammed the spy agency’s actions as political pressure on him. On October 11, the Holy and Sacred Synod of the Ecumenical Patriarchate of Constantinople confirmed its decision to grant autocephaly to the Ukrainian Church, and revoked the 1686 decision on transferring the Kiev Metropolitanate under the jurisdiction of the Moscow Patriarchate. In addition, Constantinople lifted the anathema from the leaders of Ukraine’s two non-canonical churches, Filaret of the Kiev Patriarchate and Makary of the Ukrainian Autocephalous Church. In response to these decisions, the Holy Synod of the Russian Orthodox Church ruled on October 15 that full communion with the Ecumenical Patriarchate of Constantinople was no longer possible. On November 13, the Council of Bishops of the canonical Ukrainian Orthodox Church held a meeting at the Kiev Pechersk Lavra. The Ukrainian Orthodox Church announced after the assembly that it did not recognize Constantinople’s decisions on Ukraine and severed full communion with the Ecumenical Patriarchate. The Ukrainian Orthodox Church also spoke out against joining the process of granting autocephaly to Ukraine’s church and said it opposed its name change.